In a recent, randomized, double-blind, placebo-controlled, crossover study, the effects of the GlyStrictin functional compound supplementation on glycometabolic and appetite control was evaluated. The study included twelve volunteers, 20-26 years of age, of normal weight. On two different days, the volunteers, who had fasted for at least 12 hours, received a mixed standardized meal (60% carbohydrates, 25% lipids and 15% protein) that satisfi ed 40% of an individual’s total energy requirements, with a supplement of the functional compound in GlyStrictin or placebo ingested immediately before the meal. The experiment days were separated by a washout period of 7 days. The two main objectives of the study were 1) to evaluate the effects of the supplement on glucose postprandial response, measuring glucose, insulin and C-peptide concentrations, and 2) to evaluate the effects of the supplement on appetite control by assessing plasma ghrelin and satiety sensation ratings using visual analogue scale. Plasma glucose, insulin, C-peptide, ghrelin and satiety sensation ratings were assessed at baseline and for 3 hours after meal consumption. Results showed that supplement consumption led to lower increments in glucose (p=0.04 at 30 minutes), insulin (p=0.04 between 45 and 120 minutes) and C-peptide (p=0.04 between 30 and 90 minutes) when compared to placebo. In the fi rst 2 hours, ghrelin decreased similarly in both the test group and the placebo group but did not rebound thereafter in the test group as it did in the placebo group (p=0.04). The supplement reduced the desire to eat compared to the placebo (p=0.02) over the 3 hours. DIRECTIONS: Adults take 1 capsule just before each meal. Do not exceed 3 capsules in a 24-hour period. 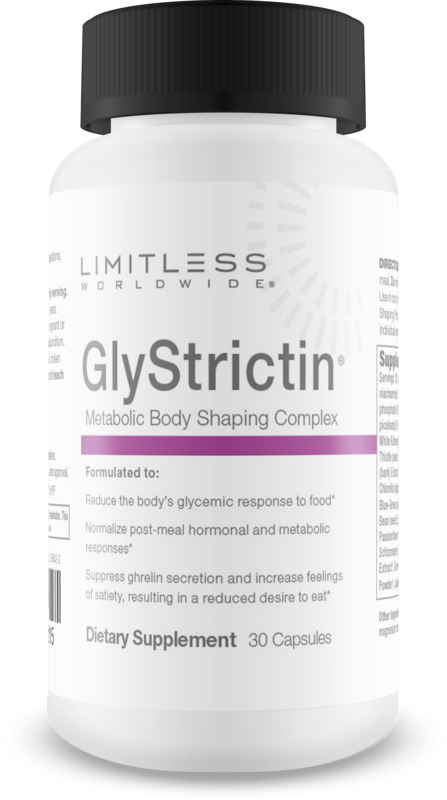 Use in conjunction with the simple GlyStrictin Body Shaping Plan available at www.limitlessworldwidellc. com. Individual results will vary. WARNING: Do not exceed suggested daily serving. Not for use by individuals under the age of 18 years. Consult your physician before use if you are pregnant or nursing, taking medication, or have a medical condition. Use only as directed. Keep out of reach of children. If you or your health-care provider have any questions, please call: 1-800-429-4290. Stearate, Silicon Dioxide, Turmeric (for color).